Videos presented here have the audio muted because of partner nation release concerns. AF BiH PAOs were new to creating videos and after a brief workshop showed clear progress in a short timeframe. TUZLA, Bosnia-Herzegovina (October 1, 2017) — Outside of my airplane window, the wing pierces thick puffy clouds as we descend into a green valley towards the tiny airfield nestled between a mountain range. I step off the plane onto the runway and look in awe at the vibrant blue sky with clouds resembling a painting. Approaching the terminal, I felt the familiar tinge of nervousness and excitement of arriving somewhere I’ve never been before. With my bags reclaimed, I rejoin my team and we drive through Bosnia-Herzegovina’s capital, Sarajevo, towards the city of Tuzla. Starting on September 24, 2017, we begin what would become a week of growth, not just for me, a recently graduated public affairs airman, but for all those involved in the training events to come. After the 16-hour journey from Baltimore and the 3-hour ride from Sarajevo, we checked into our hotel and eventually settled in for the night. The next morning would mark the official start of a week-long public affairs workshop at the Dubrave Barracks in Tuzla. My teammates, the Maryland National Guard Public Affairs Office, are here to share their knowledge of public affairs with public affairs members of the Armed Forces of Bosnia-Herzegovina. After two days of workshops and hands-on exercises in photography, video, writing, social media and public affairs, the students would be given the opportunity to apply everything they learned by covering a multinational NATO training exercise. The exercise, Exercise Bosna I Hercegovina 2017, was jointly organized by the Euro-Atlantic Disaster Response Coordination Centre and the Ministry of Security of BiH and involved more than 1,200 participants from 32 NATO allied and partner countries. The intent of the exercise was to practice disaster response mechanisms, exercise capabilities, and demonstrate each nation’s ability to work together effectively in emergency crisis response operations. The exercise involved search and rescue operations, flood response, and response to chemical incidents which will affect the civilian populations and critical infrastructure in areas surrounding Tuzla. Responding to national disasters is something the AF BiH has done time and time again over the years, added Bittenbender. They answered the call during past national disasters and offered support to anyone who needs it, providing services that save lives. However, an ongoing challenge for the AF BiH public affairs is the tedious and restrictive approval process for releasing media content, said U.S. Army Col. Charles Kohler, workshop instructor and the Maryland National Guard public affairs officer. 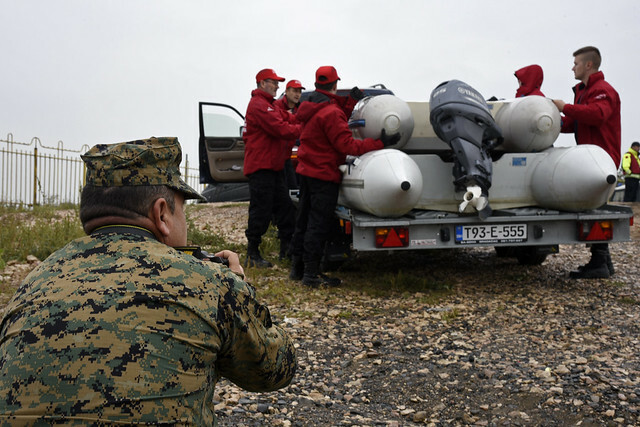 The event also had various other challenges which included a limited amount of equipment available for the members of the AF BiH to use and language barriers between instructors and other participants in the NATO exercise. Despite any setbacks, the members were still able to meet and exceed goals set for them. “The members of the AF BiH exceeded our expectations and were effective in applying public affairs skills at a tactical level,” said Kohler. Because the members have already demonstrated their capability in capturing and telling an effective story, it’s our hope approval processes will be revised to allow the AF BiH story to be shared with the public, said Kohler. “The execution of this workshop helped build and strengthen AF BiH public affairs operations, tactics, techniques and procedures in emergency situations,” said AF BiH 1st Lt. Elman Cosic, public affairs officer for the 2nd Helicopter Squadron, Air Force Brigade. Cosic was one of two AF BiH members in the workshop who had attended courses at the Defense Information School, the same school all DOD personnel attend for public affairs training.